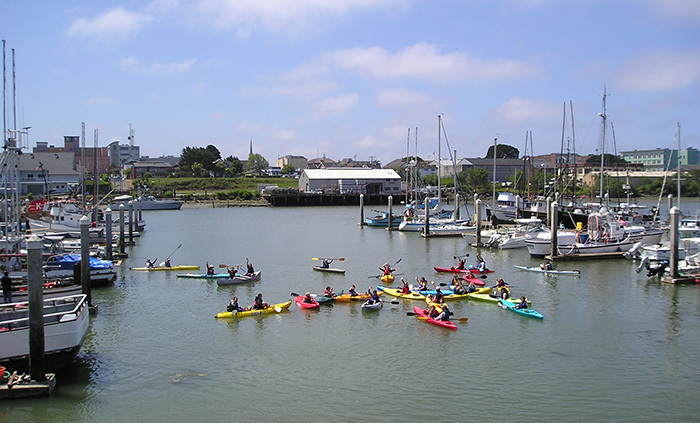 Recreational opportunities are abundant around Humboldt Bay and in the region. You can go for a hike, bird watch, take a boat ride, go kayaking or windsurfing, go fishing or clamming, explore historic neighborhoods, and do much, much more! The following lists a few of the most common recreational opportunities in Humboldt Bay. Use the Humboldt Bay Area Beaches and Dunes Recreation Map to find areas where you can enjoy the beaches and dunes. This map and guide is published by the Friends of the Dunes. It is available in print at various local tourist information centers. Traditionally, sports anglers in Humboldt Bay have pursued several species of fish including perch, leopard sharks, jacksmelt, California halibut, bat rays and salmon. Improved boat launching facilities are located throughout Humboldt Bay and include facilities in Fields Landing, Samoa Peninsula (near the Coast Guard Station), at the Eureka Public Marina, under the southern end of the Samoa Bridge, at Hookton Slough on the Humboldt Bay National Wildlife Refuge, and at the Arcata Marsh and Wildlife Sanctuary. It is important to note that the Hookton Slough launching area is for non-motorized watercraft only and the Arcata ramp is shallow and usable only at high tides. If you don't have access to a boat, Humboldt Bay offers several opportunities for fishing from shore. Some of the more popular shore fishing spots include the Del Norte Street Pier in Eureka, Elk River spit, Elk River (below the railroad bridge), Buhne Point in King Salmon, the mouth of Mad River Slough, and the north and south jetties. Note that access to the south jetty is controlled by the County of Humboldt. Also note that both jetties are subject to large, unpredictable, and dangerous waves. Please check the local weather forecast and use extreme caution when fishing on the jetties or in the vicinity of Humboldt Bay's entrance. Humboldt Bay is very productive clam habitat. Clammers seek clams such as littleneck, gaper, Martha Washington, and others. Popular clamming areas include the foot of Del Norte Street in Eureka, the foot of Truesdale Street in Eureka, "Clam Island" across the channel from the Fields Landing Boat Ramp, and various locations in Arcata (North) Bay. Seasonally, recreational fishermen can catch Dungeness and red rock crabs in Humboldt Bay. Recreational fishing in Humboldt Bay is regulated by the California Department of Fish and Game. Before going fishing, clamming or crabbing, be sure you have consulted current Fish and Game regulations for seasons, size limits, bag limits and legal fishing gear. With over 250 species of birds utilizing Humboldt Bay, birdwatching can be a year 'round activity. Popular hiking and birdwatching areas include the Arcata Marsh and Wildlife Sanctuary, the Humboldt Bay National Wildlife Refuge in southern Humboldt Bay, Faye Slough Wildlife Area north of Eureka, Mad River Slough Wildlife Area west of Arcata, Elk River Wildlife Area, and PALCO Marsh in southern Eureka. Interpretive centers that describe local bay habitats and wildlife are located at the Arcata Marsh and Wildlife Sanctuary and the Humboldt Bay National Wildlife Refuge. Beachcombing is popular on both the Pacific side of both the North and South Spits, the Elk River spit in Eureka and the King Salmon Beach. Recreational boating opportunities are available for watercraft ranging from the smallest canoes and kayaks to the largest sailboats and mega-yachts. In addition to the Humboldt Bay Harbor District's Woodley Island Marina, the City of Eureka's Public Marina is also an ideal spot to moor your boat daily, seasonally or yearly. Two private marinas are also located in the community of King Salmon, closest to the entrance to Humboldt Bay. Improved boat launching facilities are located throughout Humboldt Bay. Canoes and kayaks are popular for exploring the salt marshes that ring Humboldt Bay. In addition to the improved boat launching facilities, there are several launch areas that are appropriate for canoes and kayaks around Humboldt Bay. A public canoe/kayak launch area is located at Woodley Island Marina. In addition, canoe and kayak rentals, sales and lessons are also available at Woodley Island. Less than two-hours south of Humboldt Bay, the Humboldt Bay Harbor District also maintains California's only open-ocean boat launching facility in the community of Shelter Cove near the Humboldt - Mendocino County border. Shelter Cove is known for its spectacular bottom and salmon fishing and the towering cliffs that surround this portion of California's rugged coast. For more information for your next trip, visit the California Welcome Center off Highway 101 at the Giuntoli Lane exit in Arcata, California, or explore from your home at the Humboldt County Convention and Visitors Bureau, Arcata Chamber of Commerce, Eureka Chamber of Commerce, or Redwood Community Action Agency web sites.